Growing up, his father taught him to listen to music “democratically”. He introduced his son to all forms of music from Miles Davis to Art Blakey, so the influences were all around. But, in these stylistically diverse rhythms Cruz has come to find common threads because the African heritage in these rhythmic traditions crosses over to the drum set. He gave a great example of a common beat played on the bata drums, a Cuban instrument, which can be found in the swing beat on the drum set. 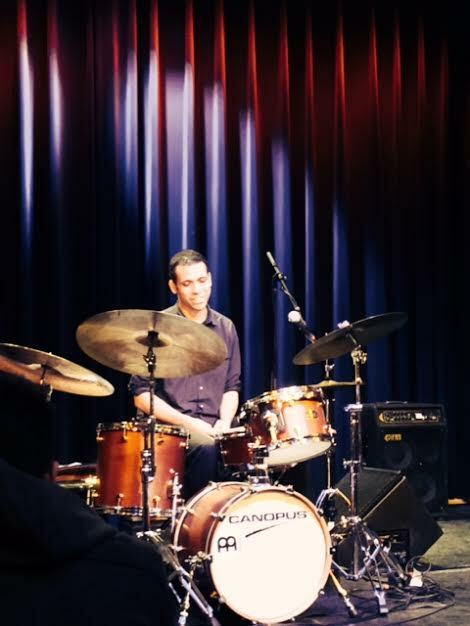 As a drummer, Cruz tries to be open with rhythms and keep them neutral. Within a straight 4/4 straight beat he combined a 6/8 clave beat, and the rhythm felt natural; it wasn’t competing. Being open and neutral allows possibility in your beat and helps drummers “make music groove.” And, how did he come to develop this appreciation for a combination of rhythms to fit and groove? Listen to what moves you. What inspires you. Because it is so personal. Cruz is coming back to town next weekend. You can see him play with the Danilo Perez trio. They come to Sculler’s Jazz Club to play four shows, Saturday (2/15) and Sunday (2/16).